The RJ45 connector allows network connection for playback of digital music over a home network. Network input was chosen as the most suitable way to transfer digital audio due to ease of setup, ability for wireless communication and advantages over S/PDIF and USB. 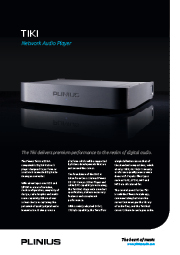 The chosen DAC allows playback of popular file types up to 24bit/192ks/s. By working within these guidelines the unit is capable of interfacing to a number of different home network devices. Mechanical damping is applied to the chassis to arrest vibration that can lead to microphonic interference and impact on the audio signals. The aluminium lid and panels provide a non-magnetic cover to reduce unwanted magnetic fields that can interfere with the sensitive audio signals. "The Tiki offers superb sound and may be one of the best digital source components auditioned in the reference system. It offers truly remarkable transparency and unveils new layers even on very familiar recordings. It is astonishing to hear more depth and recorded detail"